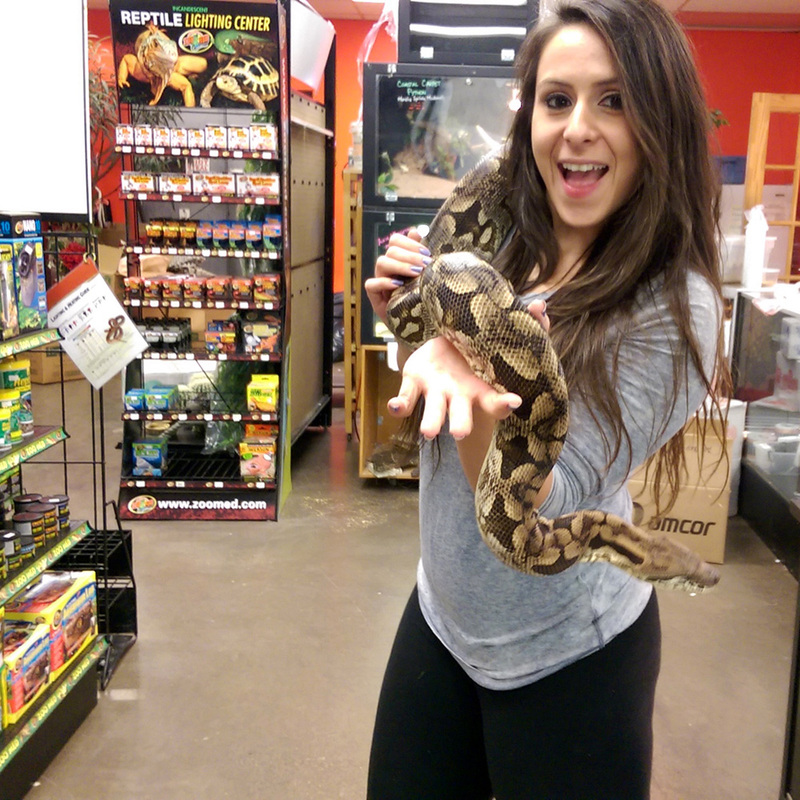 Being a small time hobbyist for most of her life Karen is now a bit of everything at All Reptiles. Although mostly behind the scenes there is truly nothing around here that Karen does not have a part of… you name it and she’s doing it. She's got a university degree in Environmental Sciences which she uses to her advantage in understanding the physiology and anatomy of reptiles and how to establish them into our living environments. Karen's vast variety of product knowledge is unmatched in the industry and she approaches all tasks with an open mind. 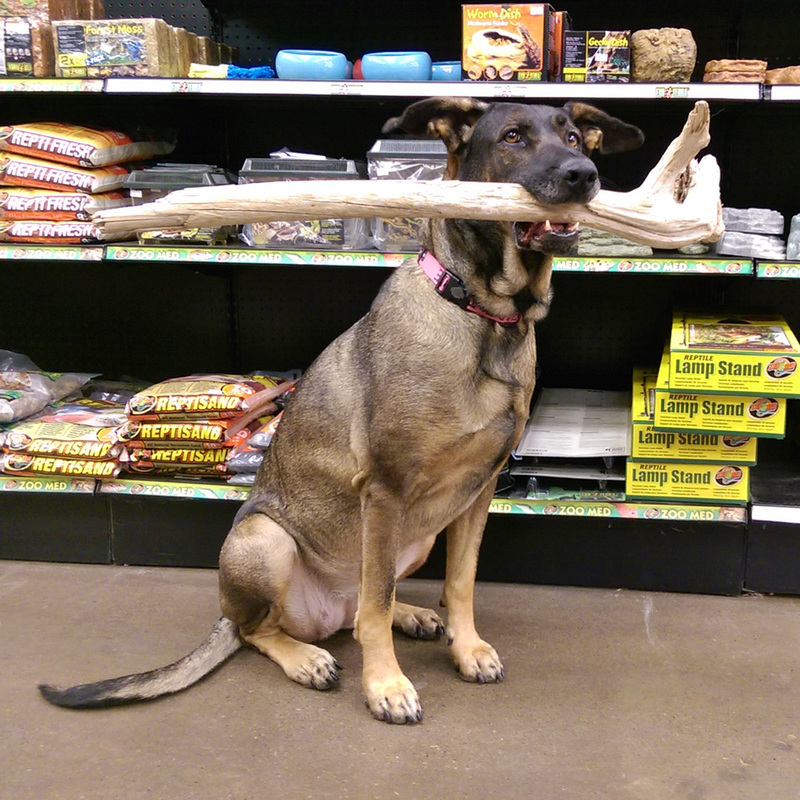 You will often see her running around the shop at quite the quick pace as everyone tries to grab a piece of her time. Our deceivingly soft spoken store manager, Jay! Although Jay has been a customer here for quite some time now, it was only at the end of summer of 2016 that we were able to bring him into our dynamic team. Jay brings lots of experience to the table and we are proud to say that he has built some of the most beautifully functional bioactive vivariums we have ever seen. 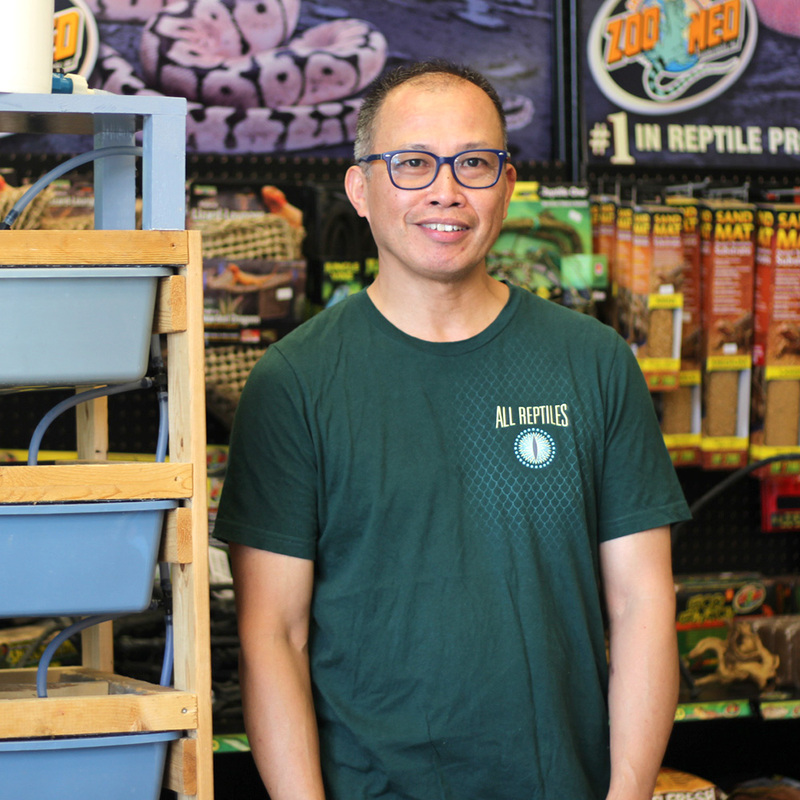 He is an expert on the topic with lots of experience breeding and keeping a wide range of amphibians from dart frogs, to newts, to salamanders. He also loves to stay busy and is often seen with busy hands nailing down his daily to do lists. Jay has gone from weekend part time to full time management recently and we are quite enjoying the new management style that he has brought to the table. We are very happy to have him join us, we have much to learn from each other and Jay is just full of fresh ideas! Kat started off as our second ever co-op student in September 2010. She has since earned her place as a permanent employee and is by far the most organized person you will find here. 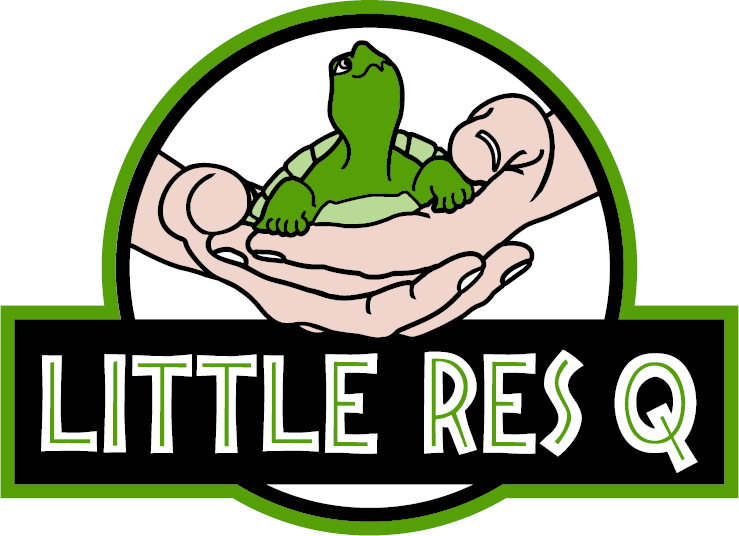 She started off shy, quiet, and a bit apprehensive, but after some rigourous training at All Reptiles, she is now bold, loud, and fearless with reptiles of all sizes and personalities. Kat likes to take initiative, ask questions, be observant, and never has to be corrected more than once to execute a difficult task. 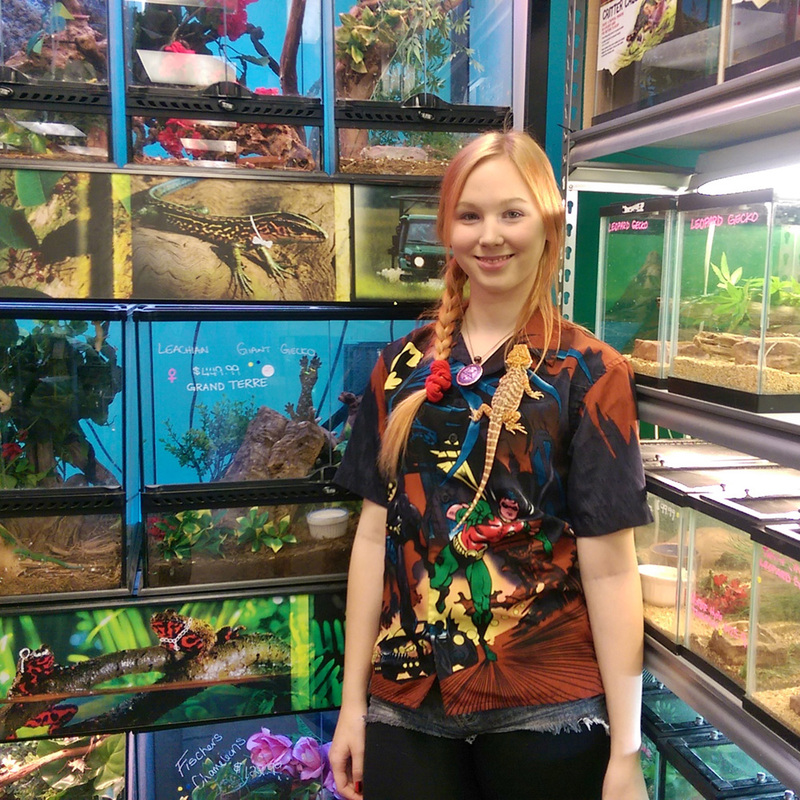 In the last couple of years, Kat has developed a keen specialty in vivarium tanks working with live plants and running water which is particularly useful for amphibian keepers and communal tanks. Kat is also our dedicated Workplace Health and Safety Officer! After doing a semester of co-op with us, Paige is now a permanent player in our team. She has earned her position here by having a very positive attitude, a natural connection to the reptiles and her eagerness to dive right into new and exciting things! She is not afraid to get down and dirty with the cleaning and loves to learn about new reptiles that arrive here every week. In her free time, Paige also loves creative crafting and listening to heavy metal music. A trooper that has been with us for two rounds of employment! Philemon first started as a volunteer in 2012 then came back to us as a part time employee in 2014. Philemon is responsible for much of our demanding cleaning jobs and he does a fantastic job ensuring that our water dishes and bins stay sterile and clean. At home, he has a Blue Tongue Skink named Tricky. In his free time, Philemon loves to watch movies and read graphic novels. He is also currently a full time student at George Brown studying Culinary Arts! Meet Lindsay! Lindsay and her hair colour of the month club is the bubbliest one here of the family. She is famously known for her comedic vocabulary, quick puns, and quirky anecdotes of her days. Her love for reptiles and all things animals is inclined to manifest in her relentless tendency to cuddle and nurture these amazing creatures in all her free time. Other than her pets and working at All Reptiles, the other love of her life is hockey. 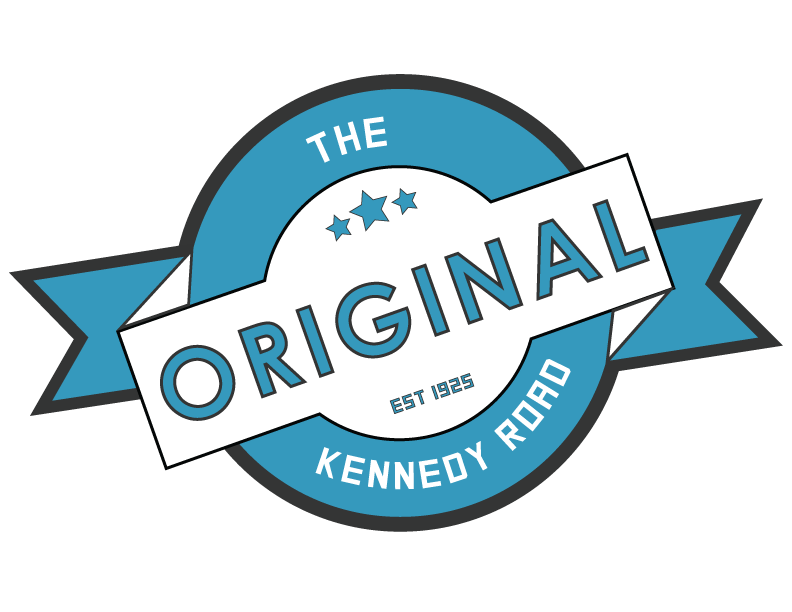 Lindsay has a rich family history in the hockey community of Toronto and to this day will not shy away from the ice and puck. So if you want to talk reptiles and hockey? Then you have come to the right person! After spending a few years in the East Coast Patrick returned home to Toronto looking to get back into the reptile industry. 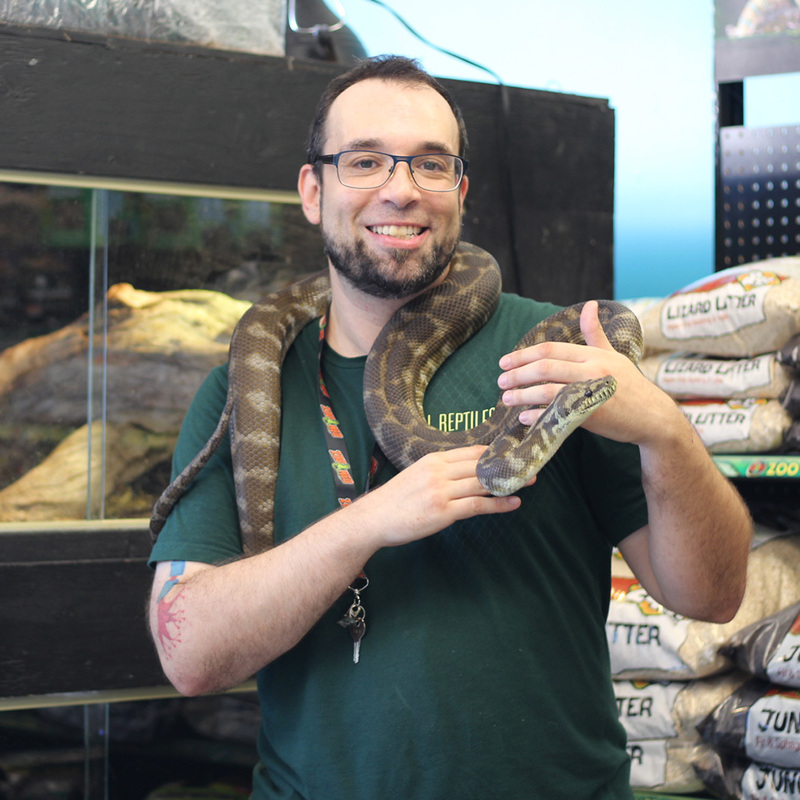 Prior to moving out East, Patrick has several years experience presenting educational shows and parties with Canada’s largest indoor reptile zoo, Reptilia, where he developed a greater understanding and love for reptiles and their environments. He is a musician at heart and loves to spend his free time talking about anything music or reptile. Patrick is also a hufe hockey fan so if you want to talk reptiles, rock n roll, and hockey, then Patrick is your man! Don’t let his seemingly shy demeanor fool you! Joe is no stranger to exotic pets in all categories. In fact, he is probably the most experienced here when it comes to birds and fish. He even has experience breeding and training German Shepherds raised as protection dogs. Reptiles are a relatively new territory for Joe but boy is he learning fast. Right now, Joe is the primary caretaker for all our rodents and he continually maintains and improves on the quality of our rodent care. If we had one word to describe Joe, it would be that he is a doer. Joe is thorough, decisive, and inventive and he loves to come up with his own ideas and opinions. We have a lot to learn from him and we welcome all the wisdom he has to share with us. Jacob is our latest addition to this family joining us after a semester of co-op training that ended in June 2018. 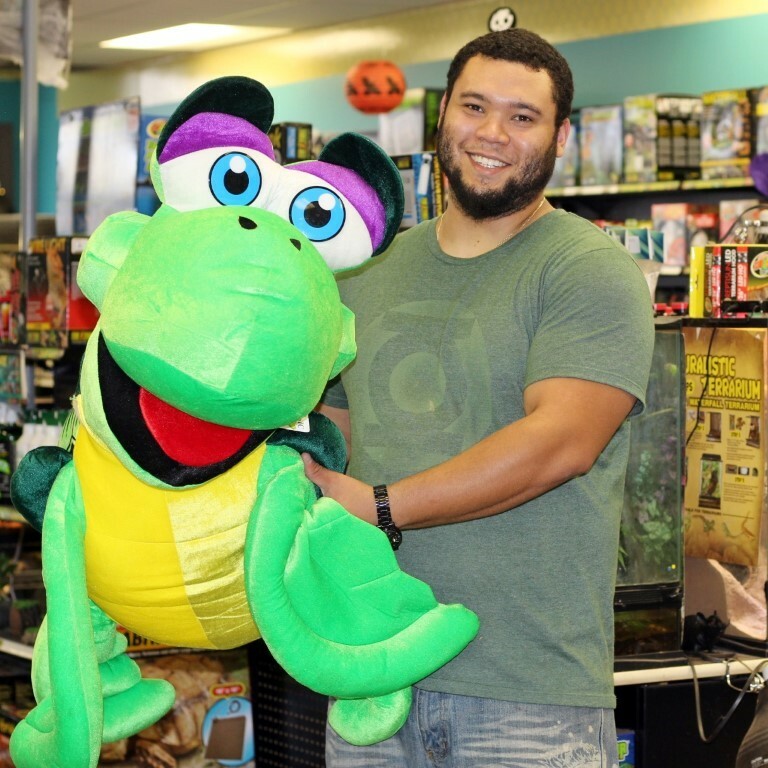 Jacob has been by far the most enthusiastic and hardworking co op student we have ever had at All Reptiles. While never missing a single shift, he would also show up early and stay late for every single one of his co-op shifts consistently for 4 months straight. Although Jacob still has a lot to learn in this industry he is a proactive with his duties, determined, and always eager to do more. 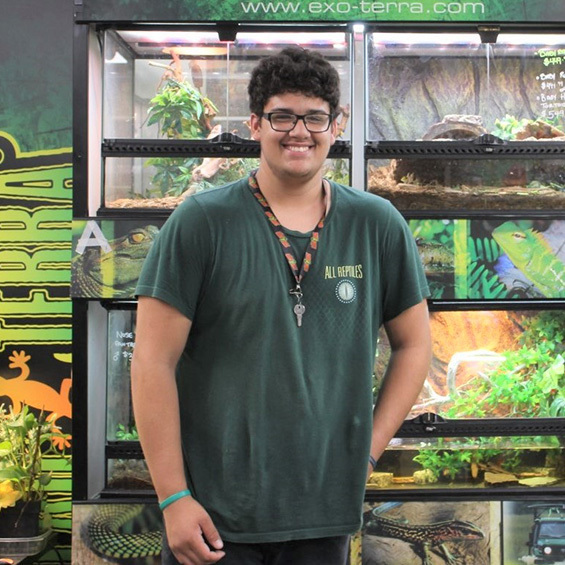 By the end of his term, he had more than earned his place here and left us with no choice but to bring him on to our permanent team at All Reptiles! Do not let his initially shy demeanor fool you, we will have him completely out of his teenage shell by the end of this year. 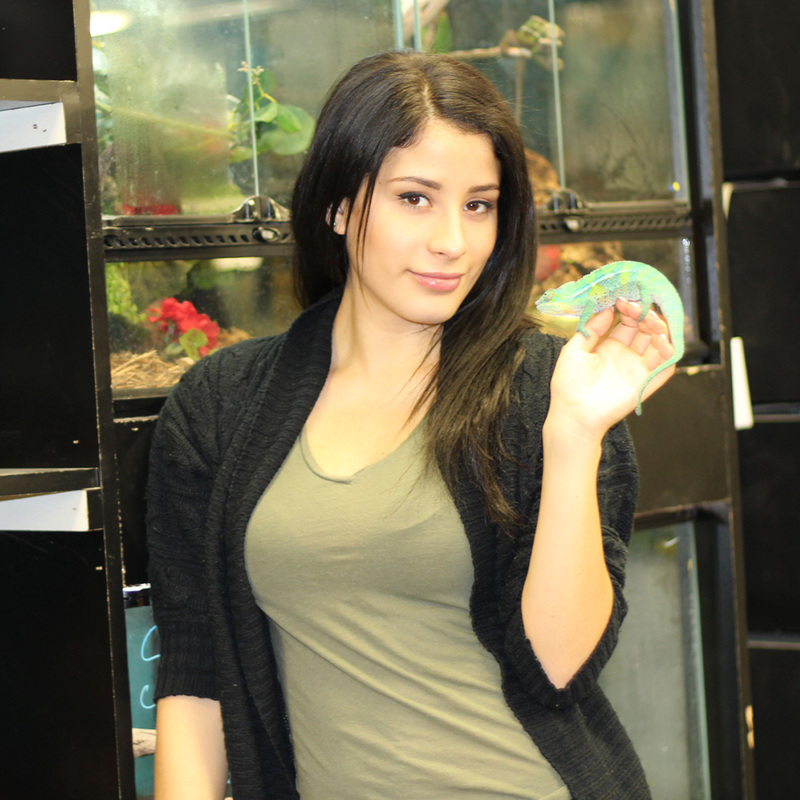 Karli is a long time veteran here at All Reptiles. She is just as enthusiastic working with reptiles today as she was on her first day here in 2013. Karli is known for her bubbly yet fearless attitude towards anything with scales, teeth, fangs, fur, stingers, feathers, or a tail. As with all other staff members here, Karli is a natural animal lover and is an avid horseback rider outside of working with reptiles and more recently has started working with birds of prey as well. 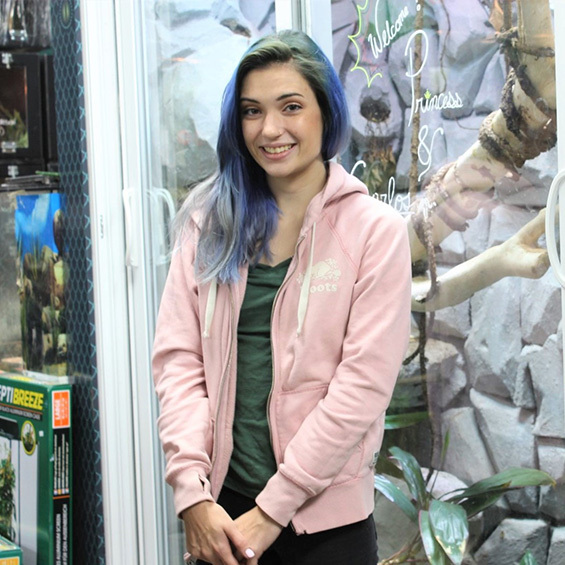 These days, Karli is rarely seen working the sales floor of All Reptiles and instead is our Special Events Representative. She proudly wears our logo when she works promotional shows for us including educational shows. If you see her, be sure to say hi because you never know when she will be back again! Soleil the German Sheppard X Great Dane is the protector of the family. 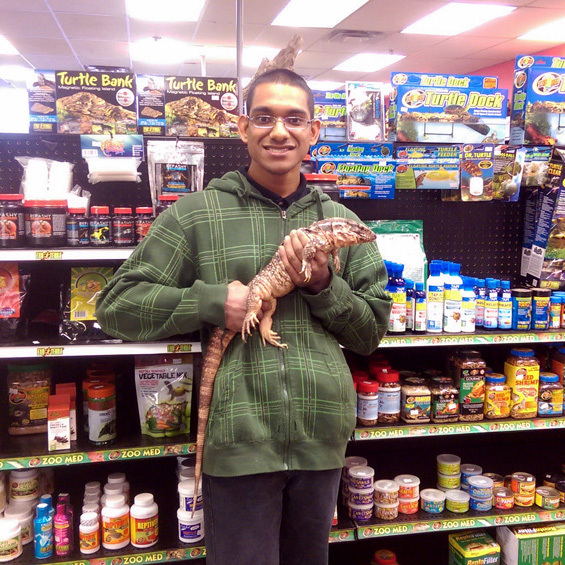 She is well loved at All Reptiles by staff and customers alike. She was abandoned by her previous owners at the vulnerable age of 2-3 weeks and found by a close customer of All Reptiles. After being told by veterinarians that her chances of survival were slim, we owe her life to Catherine Rebiero, her rescuer. Little did anyone know, Soleil is a fighter and she fought her way back to health with the loving help of Catherine. By the time she was 3 months old, she was 100% healthy and ready to be adopted into a permanent home. Soleil is now Karen's love of her life, and one is never seen without the other ever again. Nowadays Soleil is commonly found in the most inconvenient spots all over the shop most likely in someone’s way. Have no fear… just walk right over her if you have to! She is our ray of sunshine! Soleil is also now head of the Complaint Department.